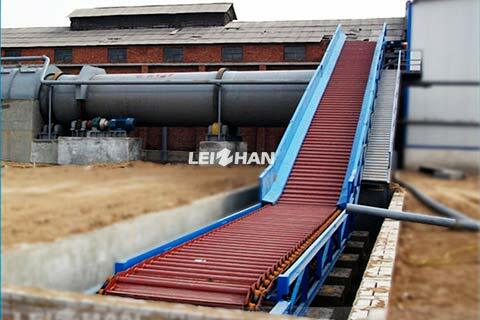 BFW Series Chain Conveyor is mainly used in papermaking industry for conveying varies of scattered and bundled waste paper . It can works when it is horizontal or Gradient less than 25°.and it is widely used for padding waste paper from ground to pulper. BFW Series Chain Conveyor has good performance with advantage of reasonable structure, large transmission capacity, lower power consumption. 1. Trough plate punch forming which high strength and excellent in crushing effect. 2. Chain board adopts closed design to prevent material leaking. 3. Two rows of idler traction chain and hollow roller shaft,and oil can be injected from pin roll to shaft sleeve and wear-resistant zinc-copper bushing. 4. Two rows of chain adopt long axis to prevent chain running deviation. 5. Chain wheel adopts cast steel to improve wear-resistant. 7. Orbit type running,operate steadily and reliably, with low friction and low power consumption.